Vlad is not your typical eighth grader. Well, he is in many ways: he’s got a massive crush on Meredith, who seems to like his best friend, Henry. He doesn’t do spectacularly well in school, but manages okay. His parents died in a freak accident three years ago, and so he has that to deal with. Oh, and did I mention? He’s a vampire. 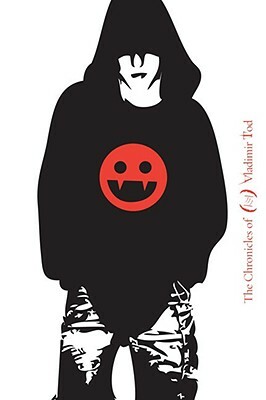 His mom was human, and his dad was a vampire and (without all that messy Twilighty swoony vampirey stuff) Vlad’s been raised as a vampire. Granted, he’s a humane one: aside from biting Henry when they were eight, he’s never actually fed upon a human, but rather eating donated blood (in very creative forms) or raw meat. (This book was written in 2007, before the Twilight phenomenon, so no unfair Breaking Dawn comparisons, please.) As if his life wasn’t complicated enough — it’s no fun being a creature of the night when you’re forced to go to school during the day! — it looks like his substitute English teacher — brought in after his teacher, the Mr. Craig of the opening sentence, disappears — is figuring out Vlad’s secret. It was billed as “ghoulishly funny”, but I didn’t really find it that. I did find it fascinating, and I liked Brewer’s take on the vampire world from the get-go. But, I guess I wanted more than a sullen eighth-grade boy (do all vampires need to be sullen?) trying to get over his dad’s death. Stick with the book, though: the ending few chapters are quite exciting. Enough so that I’m willing to give the other books in the series a try. Maybe Vlad will perk up a bit. I do have to note that the library copy I read had pages with dried blood on them. Creepy, yes, but also very annoying. Can we make it a policy to not bleed on vampire books. Please? I accidentally on purpose bought the third book in this series. I found it at a book sale. I need to go back and read the first two! Glad to hear you liked it well enough to keep going! I haven't read this yet–though I've been meaning too.